A mountanous country "Altai" extended in the South of Western Siberia for some 2000 km. It is a part of Russian territory, which borders on Mongolia, China and Kazakhstan in the South. 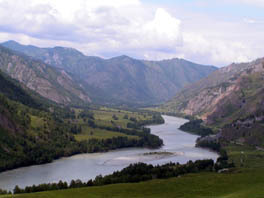 The landscapes of Altai are varied: high mountains, indented rocks, sharp dangerous cliffs and rounded hills, flat plains betweenmountainous hollows, steppes devoid of any tree, dry grasses, coniferous forests and impenetrable taiga, lakes and mineral springs, impetuous rivers and rushing noisy waterfalls. Altai is one of the rare places to be found on the planet, where virginal riches of Nature are preserved untouched by man. Here lakes and rivers contain more than 60 species of mammals, more than 200 species of birds, 8 species of reptiles, 7 species of amphibia, and 20 species of fish. Rare birds and animals, including those listed in the Red Book, are encountered here too.The Altai mountains is the highest mountainous region of Siberia. Many mountain ridges rise more than 3000-4000 m above sea level, their peaks are covered with glaciers, which slide down their slopes. The highest point on the map of the Altai mountains is the mountain Beloukha, which crowns the Katun mountain ridge. Its hight is 4506 meters above sea level. 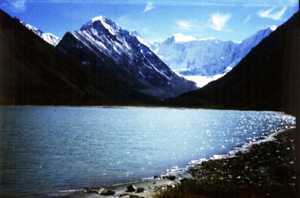 It is the highest peak of Siberia and the Asiatic part of Russia.There are 1402 glaciers on the territory of the Altai. Their overall surface cover 910 square meters. These glaciers are enormous reservoirs of sweet water where mountainous rivers and streams begin. The largest of them is the river Katun (its length is about 688 km). It springs from the glacier Gebler on the southern slope of Beloukha. 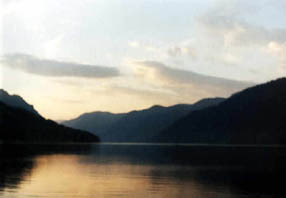 The river Bia (280 km) starts its course from the lake Teletskoye. Flowing together the both rivers give birth to the great water way of Siberia - river Obi, which flows into the Artic Ocean.One of the deepest lakes of the whole Russia and of the world at large is situated in the Altai mountains. It is the Teletskoye lake. Its depth is about 325 m. It is the second largest reservoir of sweet water after the lake Baikal. Other lakes are not so large, but none the less picturesque.The most known of them are Akkem lakes (2 lakes) situated in the region of Katun mountanous ridge, Kucherlin lakes (3 lakes), Multin lakes (3 lakes), the Talmeni lake and the Julukul lake. The last one is situated on the Chulyshman table-land and is considered sacred by the Altai people. The Altai rivers abound in waterfalls. Only in the basin of the river Katun there are about seven thousand of them. The largest waterfalls of Altai are: waterfall Tekelu with the hight of about 60 m, waterfall Tegeek with the hight of 40 m. They are situated in the region of the nothern foot of Beloukha. Here we can also mention cascade waterfalls on the river Shinok and on the river Chulcha. The overfall of their hights are 80 m and 160 m, correspondingly. 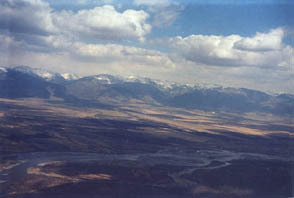 Altai has been inhabited since the dawn of life. The earliest remnants of man to be found in the Nothern Asia have been discovered in the cave Denisova. Their age is 42 000. In the river vallies and in the expansions of inter-mountain hollows, called steppes (Abaiskaya, Kanskaya, Tenguinskaya, Kuraiskaya, Chuiskaya, Ulaganskaya steppes), there are numerous archaeological sites. The relics of different epoches are found side by side. Unsolved secrets are hidden in petroglyphs - signs traced on the rocks by the hand of a primitive man, in burial mounds and neighbouring stelae -balbalas, in stone Turkic statues "kezer-tash". It is considered, that the word "Altai" comes from word "Altan" that means "gold" (compare with an Old Russian word "altyn" which meant "a coin"), however, in many Turkic languages the word Altai means "native land". It allows to assume that many peoples derive their origin from Altai, and it is not casually that Nikolay Roerich named Altai a cradle of peoples and civilizations. Many people come to Altai in order to plunge into meditations and in search of spiritual revelations - Altai is considered to be one of the spiritual and energy centres of our planet. It is a surprising mystic coincidence in the fact that the Beloukha mountain is situated right in the centre of the four oceans: the Atlantic, the Arctic, the Pacific and the Indian. One of the local names of the Beloukha mountain is Uch-Sumer, which means three peaks, three dwellings of gods. And it is here that the three great religions of the world meet: Christianity, Buddhism and Islam. - Horse excursion around the Beloukha mountain (25 days). - excursions to natural curiosities, to historical and archaeological sites. The program can include small walking and equestrian tours or hikes, a one-day rafting, excursions to hardly accessible places, acquaintance with the everyday life of local inhabitants, concerts of the Altai and Russian folk music etc. (all the year round, the shortest is a 3-day hike including the way from Novosibirsk and back, from 100 euros upwards). - Alpinist ascent for those who have experience - the Beloukha mountain (4506 ), glacier Aktrou on the North-Chuisk mountain ridge for beginners(all the year round). rivers of the Altai mountains. 0-6 degrees of complexity according to the level of preparation of the participants (June-September).